How do you keep thousands of millipedes out? Build a wall. A German village is building a foot-high wall around its boundary – to keep out millipedes. 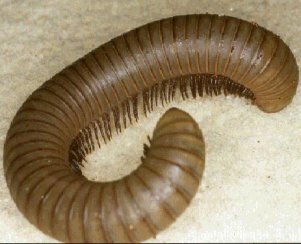 Obereichstaett in Bavaria has been plagued by thousands of millipedes every autumn for centuries, reports the Daily Telegraph. Now they just mill around the outside of the wall. By the thousands, covering the ground. There were so many in 1900 that they stopped train traffic. Trains couldn’t get a grip on the tracks. November 12, 2007 Posted by oldstersview | animals	| Comments Off on How do you keep thousands of millipedes out? Build a wall. Police in New Jersey say a black bear is suspected of stealing a people carrier and taking it for a spin. Officer Dave Dehard found the vehicle by the side of the road near Vernon Township, reports Court TV. The passenger window had been broken and the door panels were damaged. 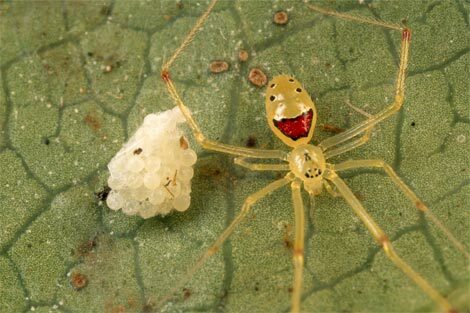 Found only on the islands of Oahu, Molokai, Maui, and Hawaii, the happy face spider, such as this one guarding its eggs on a leaf in Maui, is known for the unique patterns that decorate its pale abdomen.